Paul: All right, everyone, please stand back. Yes, there has been an explosion of games news, but we’re handling the cleanup and you don’t need to panic. Stay inside your homes, keep your windows closed and don’t eat anything off of the floor. As much as you can avoid eating things off the floor, anyway. We know what you’re like. So! Talking of explosions, let’s begin with Armageddon! 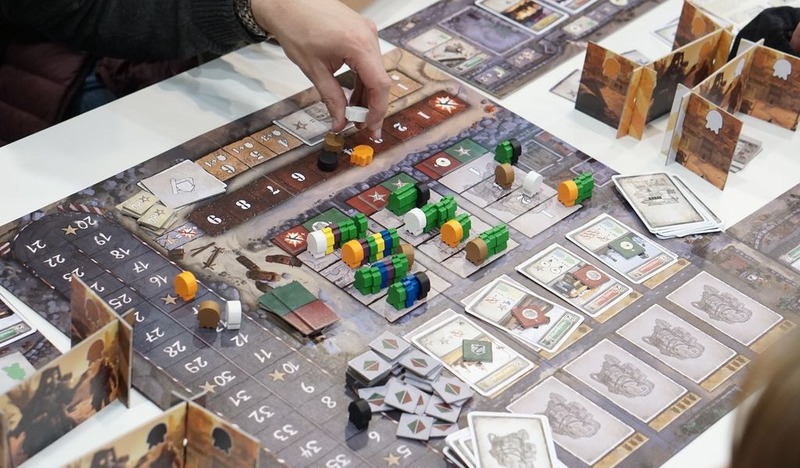 Catching my eye amongst the many, many reports still pouring out of Essen like guts out of a stomach wound, Armageddon is getting a few interesting write-ups and might be my flavour of fun. It’s all about scavenging and rebuilding in a dangerous, post-apocalyptic world. You put together a settlement of your own, recruit experts like soldiers or engineers and, of course, defend yourself from the inevitable bands of pillagers. Quinns: To look at it, Armageddon reminds me a lot of another Queen Games title, Treasure Hunter, which we thought was a very strong drafting game but just weren’t able to get excited about. 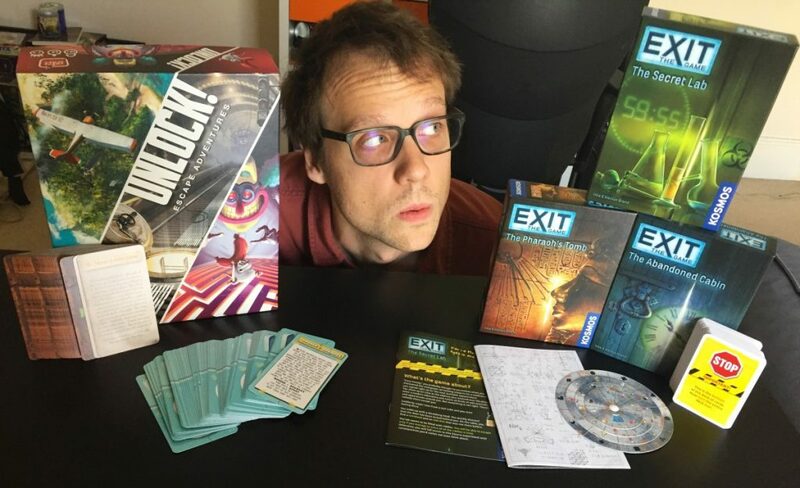 Is it me, or is this publisher’s line of designer games competent but totally unambitious? I mean, look at the theming on this game. When was the last time a publisher thought “apocalypse” was a perfectly strong theme by itself, with no twist or inventive styling? Paul: I hope you all know that we here at Shut Up & Sit Down try to keep our minds as open as possible. This week news came out that T.I.M.E. Stories publisher Space Cowboys was set to release a new episodic card puzzle game based around room escapes, and it pricked our ears like the song of a nightingale. Sure, we didn’t get along all that well with T.I.M.E. Stories, but Unlock! might make better use of those card mechanics. T.I.M.E. Stories was almost good, too! Almost cool! Maybe this is where Space Cowboys will really deliver. Quinns: Oh hey! 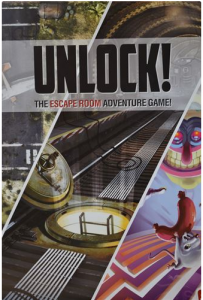 This news reminded me that I never got around to trying Escape the Room: Mystery at the Stargazer’s Manor, which I’ve since heard mixed things about. Ironically the copy we got sent appears to have escaped my living room, but it can’t have gone far. I’ll try and locate it. This week also brought news from CMON that not only are they publishing a 2nd edition of Krosmaster, it’ll be in shops this week and is fully compatible with all of the old miniatures! If you haven’t heard of Krosmaster, don’t worry! It’s probably not for you. 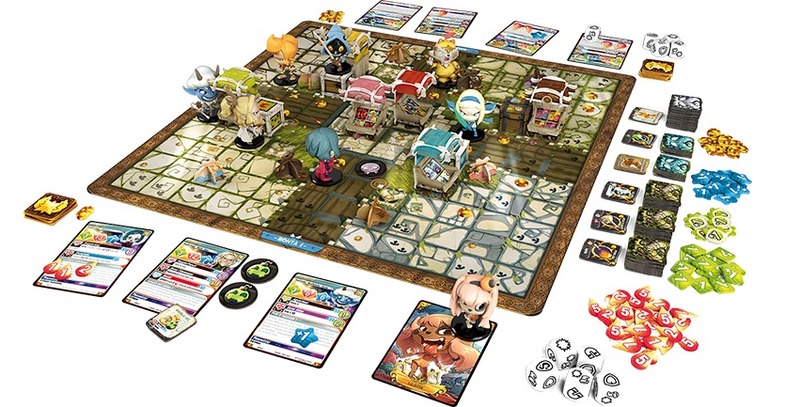 This is a very accessible, kid-friendly tactics game with fantastically cute Amiibo-looking miniatures (there’s also a “Junior” version that’s even friendlier), but there’s precious little to the actual game. Mostly what tickles me is that we’ve gone from 1st edition to 2nd edition in under 4 years. They grow up so fast! 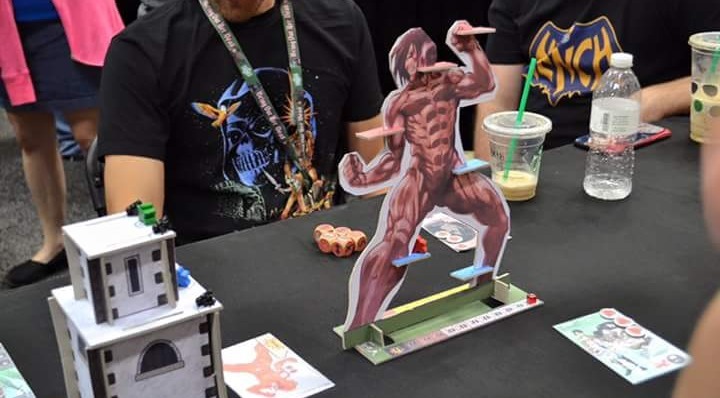 Speaking of cartoon licenses, omg I just saw the photos of Antoine Bauza’s Attack on Titan game and it has VERTICAL STANDS that you PLACE YOUR LITTLE MEEPLES ON as you ATTACK THE TITANS. I mean, I don’t particularly care about Attack on Titan or meeples, but that’s a lovely idea. 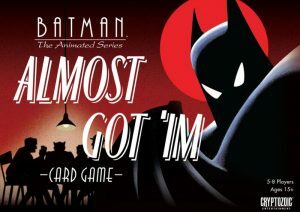 …and speaking of Cryptozoic releases, this week they announced (as far as I can tell from the box) Batman: The Animated Series: Almost Got ‘Im: Card Game. This one’s a deduction game in the style of Werewolf (werebat? ), but with a concept we haven’t seen before. The story has you all playing classic Batman villains during a poker game, and the game has you trying to assemble poker hands that will enable your special abilities. So your game of hidden roles starts not with nervy whispers, but with players requesting cards from one another. So ironically they’ve made a game which is going to be less animated than most hidden role games. Paul: Bluebeard’s Bride is one of the most curious Kickstarters we’ve seen in some time. It’s based upon the creepy folk tale of the murderous Bluebeard and tasks its players to take on different aspects of the same person. Each player takes on part of the psyche of Bluebeard’s young wife as she explores his bizarre and unsettling home, running into all sorts of unusual characters and unexpected terrors. The project has already been an enormous success, clearly finding its audience, and yet it still has weeks to run. It’s also an RPG devised entirely by women, which, unfortunately, is still a rarity and certainly something to be celebrated. Quinns: Holy cats! I was surprised as I looked at this Kickstarter page to see that it was a beautiful hardcover book, but then as you keep scrolling down the materials keep coming. An accompanying book of ominous, magical rooms? A deck of thought-provoking objects? 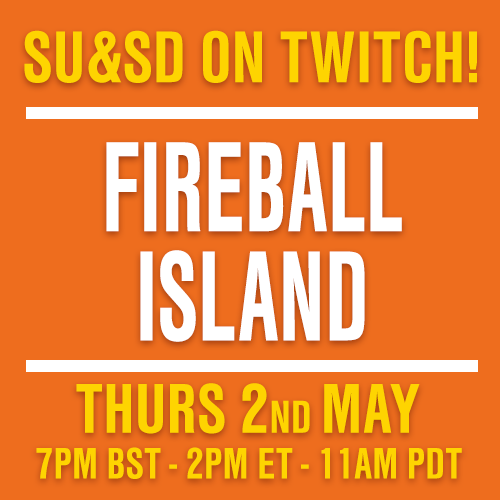 Custom dice, wooden tokens, a silk marker, a ring? I’m thrilled to bits. We’re living in an age where a magical-realist roleplaying game about sharing one person’s psyche can drum up tens of thousands of dollars. This project is ace. Paul: While we still have time, I also want to point excitedly at this remarkable custom redesign of the little-known Settlers of Catan, a game too obscure and unavailable for us to cover on this site. It’s fantastic, fetishistic work, that modifies both the rules of the game and also… well, you just have to look. You have to look at those expertly crafted components, those bright, neon-like colours and… I think there’s something about transparency in game components that I really, really like. Anyway, this is terrific and such a sight to behold. More of this, please. More. Quinns: Yeah, it’s awesome. 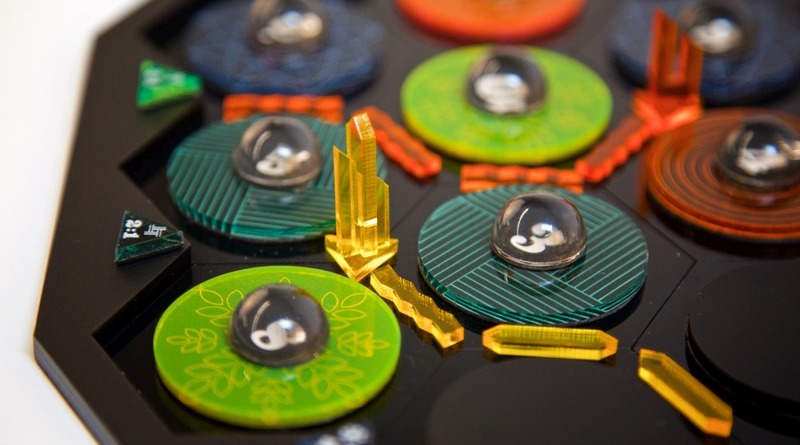 Obviously working with all of this acrylic and glass would lead to a prohibitively expensive board game, but that doesn’t mean these experiments are any less valuable for shaking the board game industry awake and exploring what’s possible. On the subject, it was fun seeing people who were at Spiel last week chat about Fold-it. And finally, since you all seemed to enjoy the Comedy Wildlife Photo Awards last week, why not check out the 2016 Wildlife Photographer of the Year contenders via their work? You want to go here and click where it says “Lightbox”.